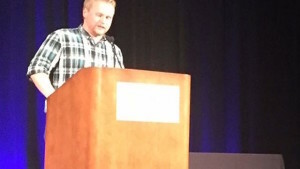 (Newswire.net — October 5, 2016) National Harbor, MD — David Ims, a graduate student in Clinical Psychology at Towson University, received a Student Paper Award by the International Society for Neurofeedback & Research (ISNR) for his research paper “Riding the Wave to Recovery: sLORETA QEEG in Sport Related Concussions.” He presented his findings last month at the ISNR 24th Annual Conference held in Orlando. Using XLNTbrain Sport™, both athletes and researchers monitored symptoms, cognitive, behavioral and physical progress throughout the recovery. This allowed researchers to compare the individual’s symptoms with the brain-wave findings. According to Dr. Kerasidis, Ims’ findings provide a look at the future of concussion management. According to Ims, next he plans to extend the study to include assessment of the effectiveness of using neurofeedback as the intervention in concussion recovery. Ims said the sLORETA analyzes electrical patterns at the surface of the scalp which reflect cortical activity, or brain waves. If you would like a demonstration of the XLNTbrain Sport concussion protocol, please register here.